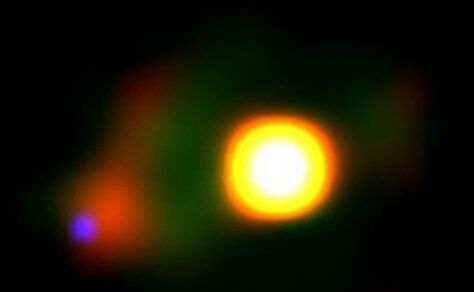 A color image of the Mira system constructed from an archival Hubble Space Telescope image. Mira B glows blue because of the violent shock front formed as the inner part of the disk crashes into the central star. The dust outflow from Mira A has a green color. The more red color from Mira B comes from the opaque edge of the disk being heated by Mira A.